From the rural town of Preston, Idaho, comes Napoleon Dynamite (Jon Heder). With a red 'fro, his moon boots, and illegal government ninja moves, he is a new kind of hero. His family consists of fragile brother Kip (Aaron Ruell), who's seeking his soulmate in online chat rooms; Uncle Rico (Jon Gries), who is stuck in his "glory" days of high school football; and Grandma (Sandy Martin), who enjoys going out to the dunes on her quad-runner. Napoleon spends his days drawing magical beasts, working on his computer hacking skills to impress the chicks, and begrudgingly feeding his Grandma's pet llama. When his friend Pedro (Efren Ramirez) decides to run for class president, it is Napoleon to the rescue to help him triumph over adversity. Download Napoleon Dynamite in Digital HD from the iTunes store. Napoleon Dynamite images are © Fox Searchlight Pictures. All Rights Reserved. Now, just imagine you're weightless, in the middle of the ocean, surrounded by tiny little seahorses. No matter how I tried, It still didn't come to me. It is however, hard to believe that it has been 10 years since Fox Searchlight Pictures released this little $400,000 film, which broke out and became the little film that could, raking in over $44 million domestically! At the time, Fox Searchlight promoted this release as an "Instant Cult Classic" and it became just that. Mention "Napoleon Dynamite" to just about anyone and you are guaranteed to get some sort of response. It may be bad, or you could end up getting so many one-liners shot at you for the rest of the day in Napoleon's annoyed vocal tone that it will drive you crazy. 10 years ago, I got to attend the local premier in our area and the Agency who came up with the promotion idea were just geniuses. Giving t-shirts with quotes to everyone in the theater, all donning different Napoleon Dynamite quotes from each screening they attended. They came from all around, even other states just to watch again and again and quote the film in the theater in masses, Yelling out "Gosh" as loud as possible. I actually thought for a moment I was lucky there were no toasts at dinner or rice for the bride. So does it surprise me that Fox Searchlight is releasing a 10th Anniversary edition for its adoring fans? Nope, not at all. 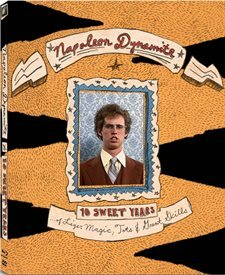 Out in stores now, is the new Napoleon Dynamite: 10 Sweet Years of Liger Magic, Tots & Great Skills all packaged nicely is its fuzzy Liger case. Inside you will find the Blu-ray and DVD versions, which include the full theatrical version (Widescreen and Pan & Scan) of the film along with a bunch of other goodies for "Napoleon Dynamite" fans including Outtakes, extended scenes, commentaries by the director and star along with a fan club piece and the Making of the Wedding of the Century featurette. So if you are clueless about the storyline, Its pretty simple, it's a high school nerd story like so many that have been put out there. But this one isn't a typical Hollywood flick, its more eclectic in style, and not what you would expect out of a High School targeted film. In fact Jared Hess starts the film off with a very Wes Anderson-like opening sequence that sets the tone for this quirky film. Enter Napoleon Dynamite, who most might say is the typical disinterested nerd, all the while I felt as if he suffered from Asperger's syndrome. Jon Header (Blades of Glory) will most likely always be remembered for his performance of Napoleon Dynamite. He creates a character that most may not identify with, but will at least find him interesting and entertaining. For the next 82 minutes you get to step into Napoleon Dynamite's strange little world. The film itself is cut together in little segments going from scene to scene with very little connecting storyline together other than this is his normal life. At one point I questioned to myself if it was possible that Jared Hess was getting left over family guy sequences from Seth Macfarlane. It went from one strange bit about feeding grandma's lama to a cow getting shot in front of a busload of kids. In fact no real storyline factors in, until Pedro, Napoleon's mustache wearing friend, ends up asking Summer and Deb to the dance. From there Pedro gets the idea to run for school president and the "Nerds shall overcome" cliché comes into play. For me the best part of the film is actually when Napoleon steps in to help his friend Pedro by dancing for him at the assembly for school president. From that moment when Napoleon starts dancing, Napoleon enters your memory forever. By the end, Pedro becomes president and Napoleon gets the girl and even gets his own 1980's John Huges-like ending accompanied by "The Promise" by When in Rome. While Jared Hess went on to Direct "Nacho Libre", "Napoleon Dynamite" was his debut and quite possibly will be the film he will be remembered for. Most of the stars of Napoleon Dynamite, haven't really broken out into bigger and better things. In fact Tina Majorino who played Deb might be the one who prospered most by landing a role on "Veronica Mars", "Big Love" and even ending up in "True Blood". Jon Gries (Uncle Rico) has landed smaller character parts in films like "Men In Black" and the "Taken" series. Efren Ramirez who played Pedro has been in caught in "Eastbound & Down" and in Will Ferrell's "Casa de mi Padre"
Jared Hess who has been relatively unheard from since "Nacho Libre", has been popping up on the internet attached to a Disney project "The Pet" and a Relativity Media project "Loomis Fargo"
Overall, I just couldn't connect with "Napoleon Dynamite". I found it to be slow, uninteresting and if it wasn't for Napoleon's dance scene, I would say it would have been painful. I give it One "Gosh!" 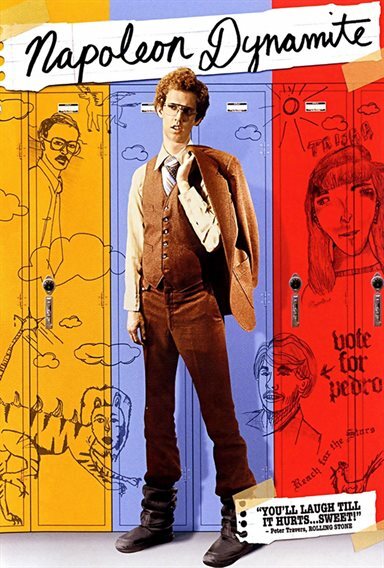 out of five……but I'm sure Napoleon Dynamite's fans will think its totally Freaking Sweet!